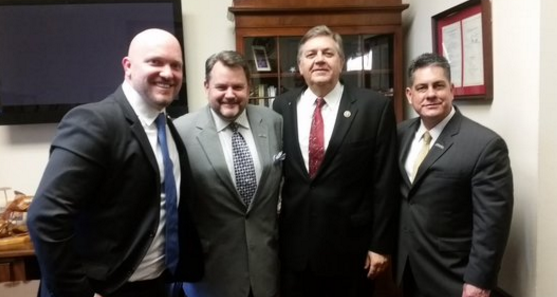 WASHINGTON (November 18, 2015) — Iraq and Afghanistan Veterans of America (IAVA) yesterday met with Rep. Dan Benishek (R-MI) on November 17, 2015, to request his support for the James Zadroga 9/11 Health and Compensation Reauthorization Act (S.928 / H.R.1786), which would fully extend the World Trade Center Health Program and Victim Compensation Fund. “Serving as a doctor within the Veterans Health Administration, and as the Chairman of the House Veterans’ Affairs Health Subcommittee, Rep. Benishek is committed to ensuring our heroes get the care they deserve,” said IAVA Founder and CEO Paul Rieckhoff. Yesterday, other veterans’ organizations, including the American Legion, Vietnam Veterans of America (VVA) and The United States Army Warrant Officers Association (USAWOA) stood with IAVA in support for the measure during a press conference at the U.S. Capitol. IAVA also launched a grassroots campaign calling on veterans and supporters to contact their Members of Congress urging them to support the legislation.